Flying Colors on ISO 9001 Audit | Accu-Fab, Inc. The ACCU- FAB team soared through our ISO 9001:2008 Certification surveillance audit this month! Having already implemented key elements of ISO’s TS standards into our processes & procedures over the past two years, ACCU-FAB is now preparing a gap assessment to initiate revisions to our operating process and procedures that will align with the latest ISO 9001:2015 standards. 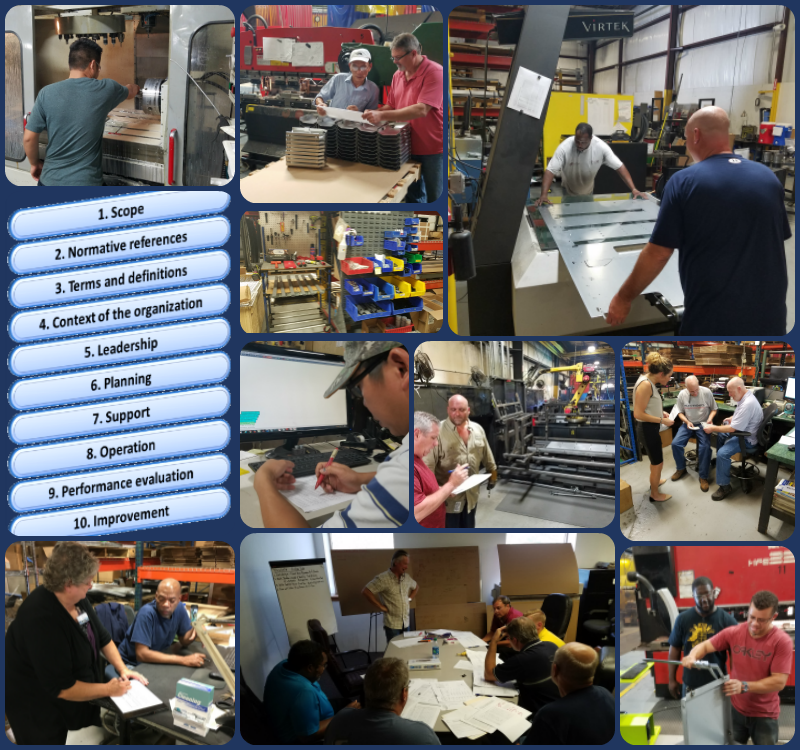 Pictured bottom-left: ISO Auditor, Beck Gill, shared her insight regarding the revised 2015 ISO standards with Accu-Fab Inspector, Roosevelt Mitchell, during ACCU-FAB’s 9001:2008 surveillance audit this month. The main change effects the sequence of chapters, titles, and the ordering of paragraphs, which were restructured to align with the layout of other ISO management system standards. The objective is to facilitate the integration of businesses’ various management systems to achieve a more unified standards documentation system. One tool we’ve found to be useful to identify which elements of the standard have been moved to other sections is the correlation matrix, available from ISO/TC 176/SC 2. Additionally, while organizations are still required to document and preserve relevant information, the 2015 revision does away with the requirement to maintain an up-to-date quality manual. We’ll continue to share insight from our experience during the transition process to compliance with ISO’s revised 2015 standards – Stay Tuned!